I got interested in drawing when I was about eight years old. One spring break my cousins came to visit me and they brought a stack of comic books with them. I started reading and collecting Spider-Man and X-Men. My cousins and I also started imagining our own superheroes and villains. We would draw on notebooks or on folded pieces of paper and make our own comics. I have been drawing and writing since then. This is technically your first book for adults, do I have that right? Where did Undocumented come from? Undocumented began as my senior project. I studied illustration and writing at Parsons School of Design and at Eugene Lang College in New York City. I really liked graphic novels like Maus and Persepolis and I wanted to create an illustrated book that tackled a political subject. At the time I volunteered at a worker’s center called NMASS. At the center I met different people – some with documents, some undocumented – who were being exploited at their job. At NMASS they met and organized to try to improve their working conditions. Juan’s story in the book is a composite of different people I met there. When you were working on this, in your mind were you making a book for adults? Or were you working the same way and thinking about it the same way you did your picture books? Undocumented definitely began as a book for adults. I did not consider making books for children until my last year in college. One day while still working on my senior project some professors from my university came to critique our work. A design teacher really liked my project and thought my illustrations were interesting. She asked me if she could show my work to a children’s book editor she was friends. I said of course. The editor, a man named Howard, liked my artwork. I met with him at his office, which happened to be about five blocks from where I went to school. He did not think that the book I was making was right for him to publish, but he said that if he received a picture book manuscript that suited my art style he would get in touch with me. I told him that I liked writing too. He told me some basic things about picture books and gave me his email. Some time later I wrote my first picture book manuscript and eventually, after many revisions, it became my first published book: Dear Primo: A Letter To My Cousin. I have authored-illustrated six more picture books since then and I have also illustrated two books by other authors. Even though I began Undocumented more then ten years ago, I was only able to finish it and publish it this year. 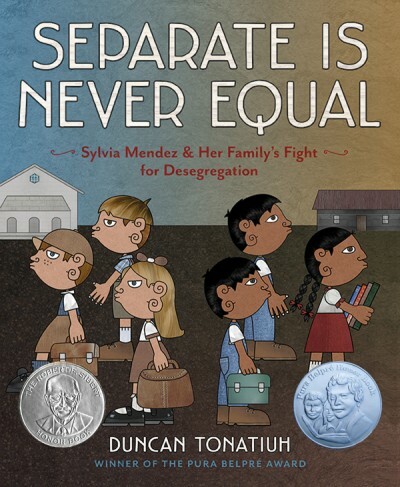 Because I am primarily known as a children’s book author and illustrator I made sure that Undocumented was kid friendly and that there was nothing inappropriate if a young reader read it. I did not have to change much – I got rid of a couple curse words – because my aim in general is to make books that are accessible, and that both children and adults can enjoy. For people who don’t know, could you say a little about what Mixtec codices are and why they were such a big influence on you and your work? What about them spoke to you? Some of the people I met at the worker’s center were Mixtec. Mixtecs are an indigenous group from southern Mexico. When I first decided to make Undocumented I went to my university’s library to look up Mixtec artwork to inform my project. In books I found images from Mixtec codices from the 14th century. I grew up in Mexico and I was familiar with Pre-Columbian art. I remember seeing it on the cover of my school text books. But I never paid much attention to it. Growing up I was interested in comic books, anime and later on in painters like Van Gogh and Egon Schiele. But that day at the library I was struck by how stylized the drawings in the codices were. I was intrigued by their flatness, geometry and repetition of color. I decided I would make the illustrations for my project in a similar style. I have been drawing in a Pre-Columbian like style since then. It has become a way for me to celebrate my heritage. I want to keep that tradition of art alive and I want to introduce it to a new audience. 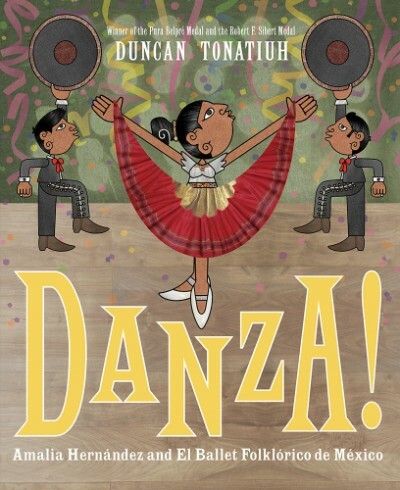 I especially hope that Latinx children see it and realize, if they have not already, that they come from a rich tradition of art. Why did you decide to make the book in this accordion format and how do you think that changes the experience of the story for the reader? The codices I was inspired by, fold out like accordions. I tried to design Undocumented so that it can be read like a book, spread by spread, but also so that the pages flow into one another and so that it can be opened and looked at all at once like a mural. I think that when you look at the book spread by spread time works in a more linear way and the story is about a specific character. When you open it all up and look at all the spreads together it feels to me more like Juan is a symbol, or an icon, and his story represents the experiences that millions of immigrants go through. How much research did you do to make the book? Most of the research for the story comes from listening to different people at the worker’s center talk about their experiences. At the end of the book I included an author’s note that gives more context and shows that Juan’s story is not an isolated case but that his struggle is one that millions of workers can relate to. I found great studies by the Pew Research Center with useful statistics. I also found a very good study by the National Employment Law Project that shows that the pervasive exploitation that undocumented immigrants experience affects all of us because it deteriorates wages and conditions for all working people regardless of whether they are citizens, authorized or unauthorized immigrants. You have this long working relationship with Abrams. What do you like about working with the team here and what’s the process like working with them? Undocumented is the eighth book I have made with Abrams. All of them have been edited by Howard Reeves, the editor the professor introduced me to ten years ago. Howard has become a good friend. He supports my vision and he looks out for me. Everyone I have met at Abrams is very dedicated and professional. They produce beautiful books and they do an excellent job marketing them. Abrams is a large company, but they are not so big that I ever feel lost. It is like a big family. 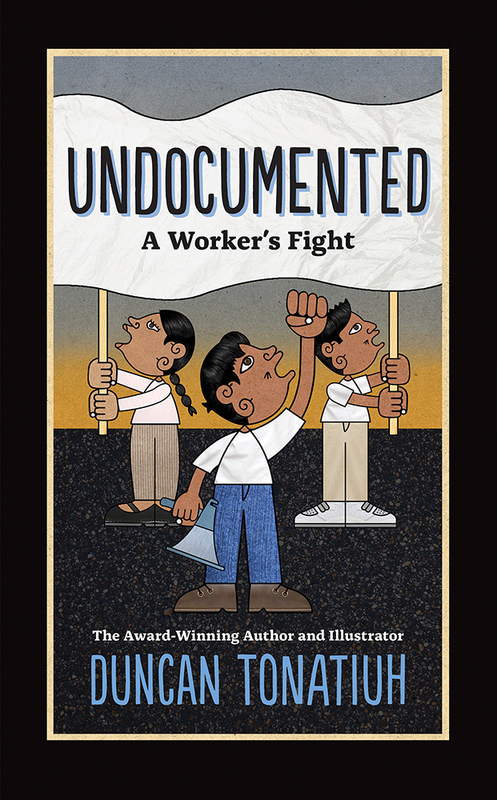 Undocumented is an unusual book, especially because of its format. I really appreciate that the team at Abrams looked at it again and supported publishing it. Undocumented really felt like one of your books, similar but different from the other books of yours that I’ve read. I’m sure you’re working on something else – or many somethings – but has doing this made you think about other work you’d like to do, other ways you’d like to try a different approach or form going forward? It would be great to do another accordion book. It has its own set of design challenges. It is like figuring out a large puzzle. It would be cool to do other projects for adults too. I have a blog that I have not posted to in a long time. I made several personal projects for it, mostly illustrations about politics and current events. I would like to do more of them. I also have ideas for future books in which my art changes some. I think I have very identifiable style – and I like that – but I don’t want it to feel repetitive. I have some ideas for how to make my illustrations look different yet also remain recognizably me.